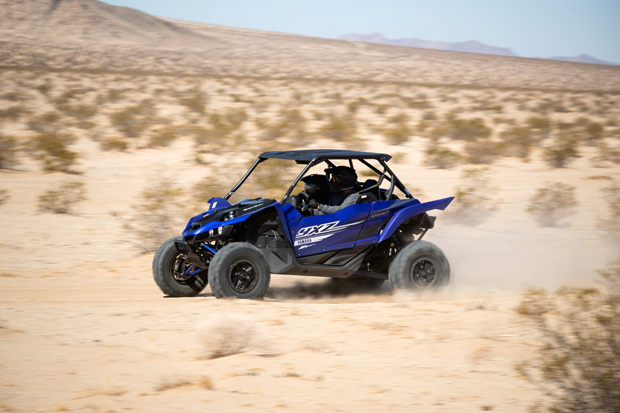 For 2019, Yamaha took what they learned through racing and customer feedback, releasing a significantly updated YXZ to better meet the demands of Sport side-by-side enthusiasts from coast to coast. At UTV on Demand, we don’t typically begin a review with our final conclusion. However, this is one occasion where we’re willing to make an exception. 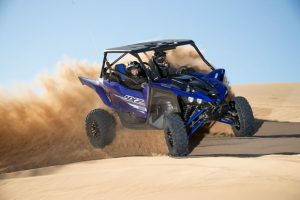 Because, you see, Yamaha’s YXZ1000R is easily the most improved sport SxS of 2019, and a machine that many enthusiasts considering a new machine should strongly consider. 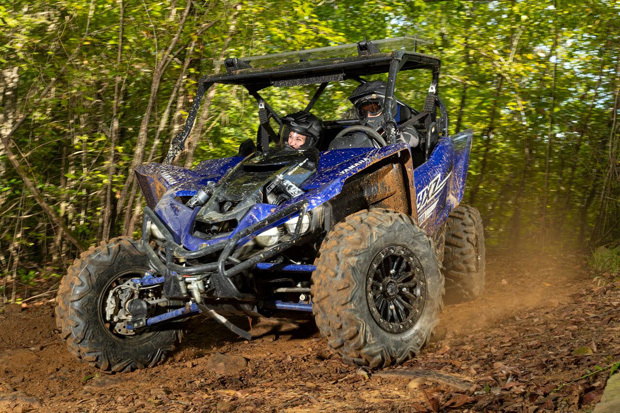 If you’re just getting into side-by-sides, the YXZ1000R’s 5-speed, fully manual or electronic paddle shift-equipped Sport Shift models, offer the unique ability to bang through gears, dump the clutch for holeshots, and pick the best gear for the situation you’re driving in. 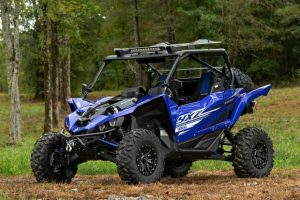 If you’ve looked past the YXZ in the past, believing it was only suited for wide open spaces or short course racing, Yamaha has turned the YXZ into a very capable East Coast trail cruiser while improving its performance in the areas it already excelled in. 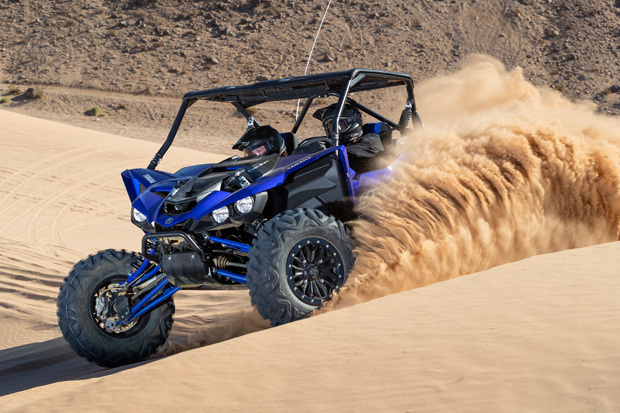 Since Yamaha debuted the YXZ1000R in 2016, we’ve spent days testing in the Glamis sand dunes and the nearby Superstition Mountains. 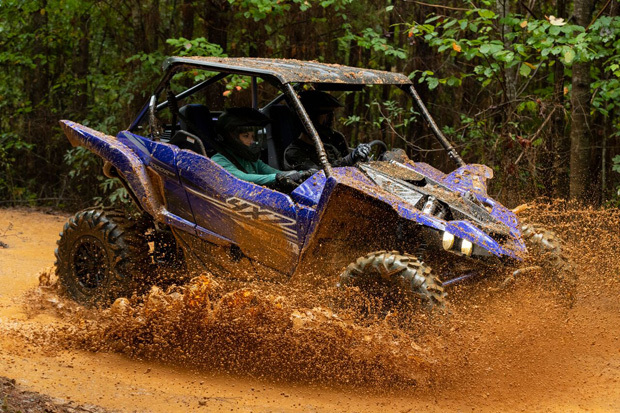 With lots of sport ATV experience under their belts, our drivers got along well with the five-speed manual shift transmission. With its taller gearing, many less experienced drivers were burning through clutches on technical low-speed trails, and upsizing from the stock 27” tires made things even more difficult. In 2017, Yamaha added the SS model to their lineup, removing the manual clutch and adding electronic paddle shifters. The system intelligently shifted down at lower speeds and slipped the clutch when needed at low speeds in first gear. We felt Sport Shift aided driver control a bit by allowing you to keep both hands on the wheel. 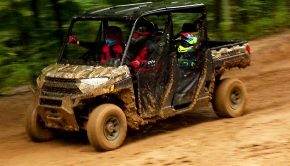 It also made the YXZ more manageable at slower speeds for less experienced drivers, although its first gear was still rather tall for extremely slow technical terrain or when adding larger tires. The release of the Special Edition model in 2017 added Fox X2 shocks with Internal Bypass and anti-bottoming technology, dual-rate springs with adjustable crossovers, plus high and low-speed compression as well as high and low-speed round damping adjustments. These shocks offered a plusher ride at slower speeds and helped settle down the back end a bit in deep whoops. For 2019, Yamaha took what they learned through racing and customer feedback, releasing a significantly updated YXZ to better meet the demands of Sport side-by-side enthusiasts from coast to coast. To prove it, Yamaha invited members of the media to two events: first, in the wooded trails of Stoney Lonesome OHV park in Bremen, AL; then, in the desert in Johnson Valley in Southern California, home of the notoriously grueling King of the Hammers race. The SE versions come with beadlock wheels, painted bodywork, color matched embroidered seats, rear view mirror, UHMW rear skid plate, rear shock protectors, and rear A-Arm guards. The SE model’s Fox RC2 shocks receive an upgrade from progressively wound springs to a separate dual rate spring and crossover setup. 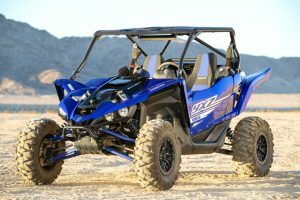 For 2019, Yamaha is still offering both manual and Sport Shift versions of the YXZ with special edition versions of both. The SE versions come with beadlock wheels, painted bodywork, color matched embroidered seats, rear view mirror, UHMW rear skid plate, rear shock protectors, and rear A-Arm guards. The SE model’s Fox RC2 shocks receive an upgrade from progressively wound springs to a separate dual rate spring and crossover setup. The SS SE models also receive a special shift lever plus aluminum gas and brake pedals. The Sport Shift variants feature an even more decked out, Pearl White SE model featuring a sun top, interior LED lighting, auxiliary LED light pods on the redesigned front center, and, most significantly, an upgrade to Fox’s more sophisticated Podium X2 shocks. The Pearl White SS SE model additionally featurs a sun top, interior LED lighting, auxiliary LED light pods on the redesigned front center, and an upgrade to Fox’s more sophisticated Podium X2 shocks. With our testing focusing on the Yamaha Blue, Special Edition Sport Shift model, remember that the manual shift versions enjoy all of the same updates as the SS models minus the ones specific to the Sport Shift’s functionality. The roof on our test unit was a Yamaha accessory add-on. The 998cc, liquid-cooled, DOHC inline three-cylinder engine’s top end hasn’t changed for 2019. The chassis’ basic design and suspension travel are also unchanged with 16.2” up front and 17” out back, although nearly every system on the car has received some sort of revision many of which are race inspired. To improve terrain ability, especially at lower speeds, many of the 2019’s updates center around making the car perform optimally with larger 29 to 30” tires. The transmission began with a switch from 27” to 29×8-14 front and 29×11-14 rear 8-ply Maxxis Bighorn tires, which are said to improve traction, ground clearance, and durability. 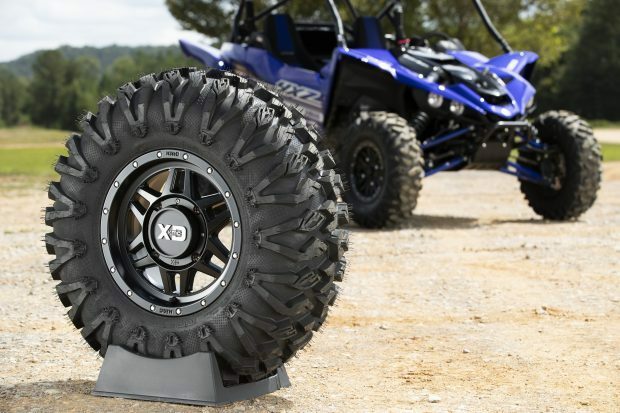 Yamaha is offering slightly more specialized, 30” accessory tires from EFX and wheels from KMC, setting up your machine with the same size wheel and tire all the way around. This is something we feel Yamaha should do from the factory, especially on SE models where customers have already paid for beadlock wheels. A 30% larger wheel bolt pattern for 2019 improves wheel and hub strength with the larger tires. Additionally, the double angular contact front wheel bearings have been increased in size from 55 to 62mm. The brakes have been beefed up including a switch to stainless steel brake lines. To help slow the increased rotating mass, the brakes have been beefed up with 10mm larger rotors up front. Brake piston size has been increased by 2mm front, 3mm rear, and the master cylinder’s size has increased from 17.5mm to 19mm. Stainless steel braided brake lines are new for 2019. Power steering has been optimized to work with 29” to 30” tires. With three different Fox Shox packages based on which YXZ model you choose, all three shocks are set up to accomplish the same things. Yamaha wanted improved low-speed comfort without increasing body-roll, along with providing a more balanced ride in high-speed whoops. 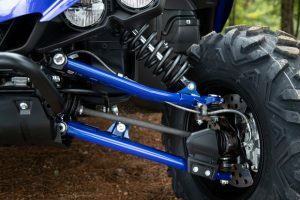 Comparing the 2018 and 2019 shocks, Yamaha softened the initial and final spring rates accompanied by an increase in spring preload. Internally, the shocks feature higher flow pistons with new valuing that increases compression and reduces rebound damping. 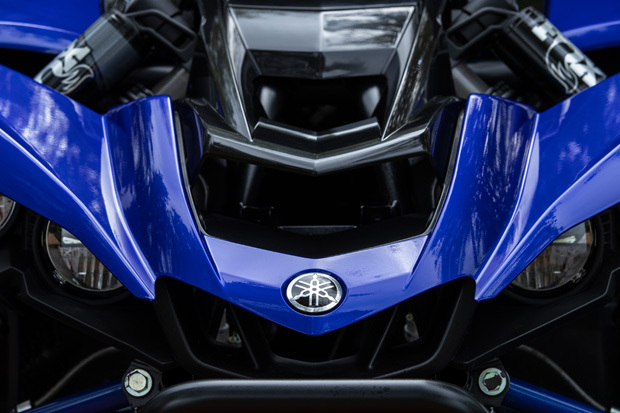 Yamaha softened the initial and final spring rates accompanied by an increase in spring preload. Internally, the shocks feature higher flow pistons with new valuing that increases compression and reduces rebound damping. 2” taller tires could potentially raise the car an inch. 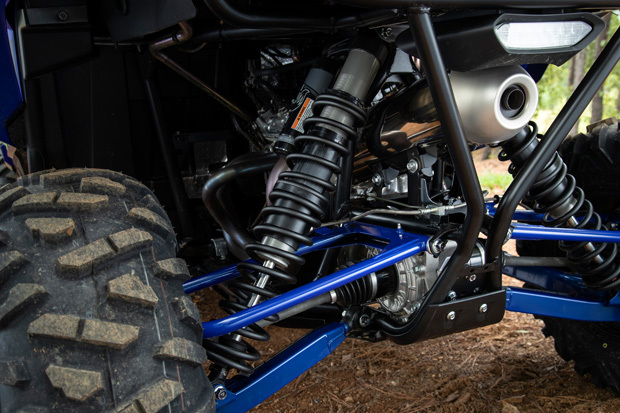 The new suspension settings have the YXZ riding lower in the travel with the 2019 up .3”, to 13.2” of ground clearance. The sway bar length has been shortened 10mm to 782mm, reducing the angle of the sway bar links for improved durability. 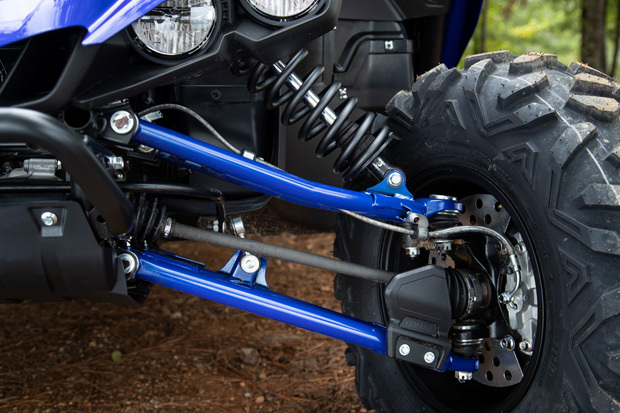 Formerly used on SE models only, the cast aluminum rear knuckles at the ends of the control arms, are now used across the entire YXZ lineup, reducing unsprung weight by 4.4lbs per side. Gearing has been lowered 24% in first gear and 7% in second through fifth. With a 7% increase in tire size, first gear is effectively around 17% lower with 2nd through 5th gears remaining roughly the same as 2018. 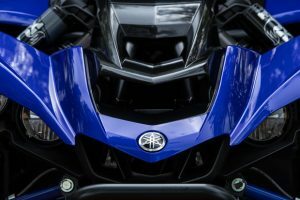 To more easily turn those larger tires and improve durability, Yamaha did some pretty extensive work to the fuel-injected, 998cc, inline three-cylinder engine’s bottom end and cooling system. Gearing has been lowered 24% in first gear and 7% in second through fifth. With a 7% increase in tire size, first gear is effectively around 17% lower with 2nd through 5th gears remaining roughly the same as 2018. The lower gear ratios were accompanied by Sport Shift MCU Logic version 2.0. The new programming is said to result in improved clutch engagement and 50% less half clutch timing during down shifting for improved engine braking. A lower first gear means less demand on the shift system needing to half clutch to maintain momentum, allowing for 40% less clutch disengagement at slow speeds. Dynamic clutch engagement has also been added to reverse for 2019. The revised gear ratios and new MCU Logic are said to result in a whopping 230% increase in clutch durability. The transmission’s rear output shaft seal and gear case input shaft dust cover have also been updated. 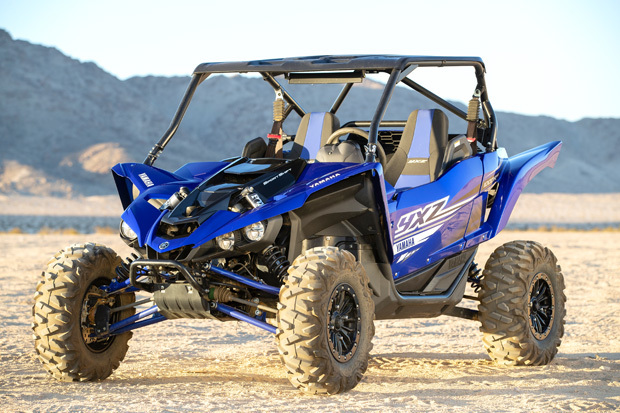 the YXZ now comes standard with Yamaha’s turbo rods. 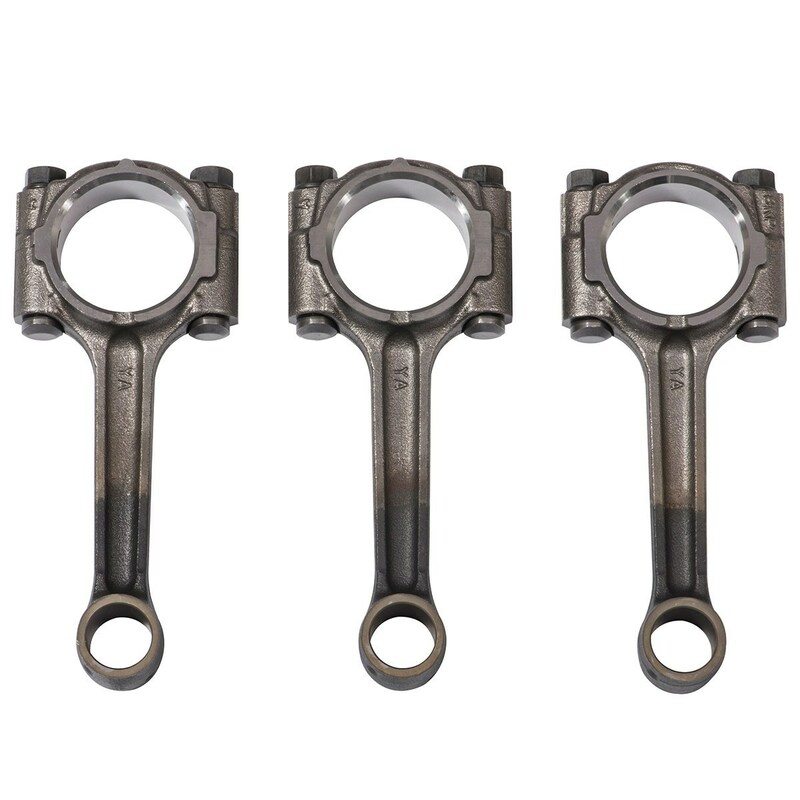 These upgraded connecting rods are rated to handle over 200hp. 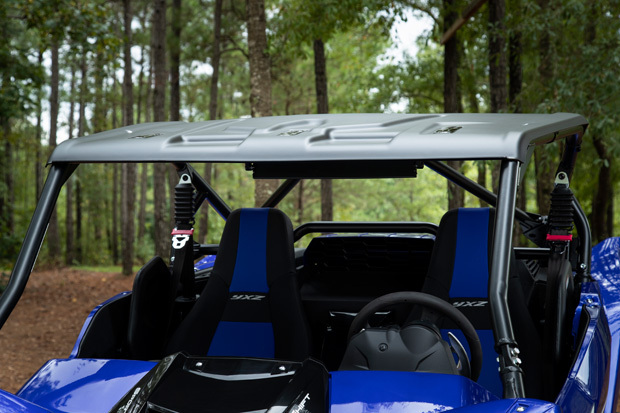 Formerly an accessory add-on, the YXZ now comes standard with Yamaha’s turbo rods. 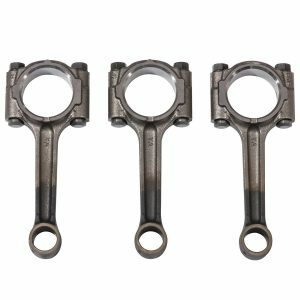 These upgraded connecting rods are rated to handle over 200hp. This should make stock or mildly tuned engines even more robust while cutting 16.5 hours in installation time for owners looking to build a much higher horsepower race motor. Relocating the radiator in the bed helps prevent it from becoming clogged with debris while providing easier access for cleaning. The new radiator is 32% larger with twin fans, providing a claimed 300% increase in airflow. Its triple intake system is designed to allow plenty of airflow even with accessories that close off airflow through the cab. Relocating the radiator also reduced cabin temperature, a claimed 14% at the driver’s back and 31% at the center console. Relocating the radiator in the bed helps prevent it from becoming clogged with debris. The new radiator is 32% larger with twin fans, providing a claimed 300% increase in airflow. With the addition of the radiator, the bed is now roughly 27.5” wide and 12.5” deep. That’s ¾” wider with an 11” reduction in depth. 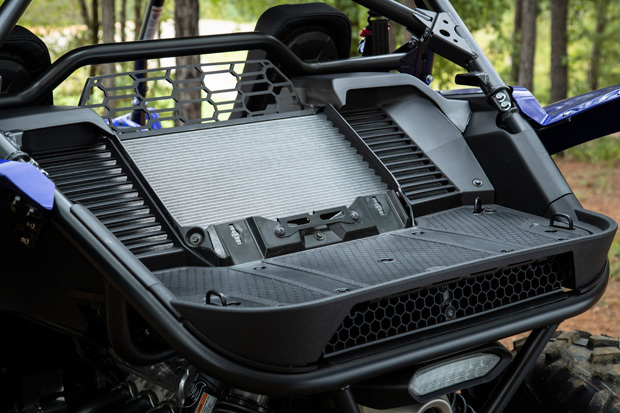 It retains its 300lb capacity and four welded on, tie down hooks in addition to now allowing the installation of Yamaha’s accessory tire carrier or bed box without modification. While some will complain about the loss in bed space, we say stop whining! Yamaha is simply compromising less when it comes to building a true performance machine. Up front, the radiator was replaced with a compartment for a second accessory battery. Up front, the radiator was replaced with a compartment for a second accessory battery. Dual battery isolation means that accessories won’t drain the start battery. A smart voltage sensing regulator makes sure the start battery will charge before the accessory battery. The roll cage’s profile has been flattened, lowering the vehicle’s overall height by 2.4” helping keep the center of gravity down and easing loading in shorter trailers. The new shape provides 3.6° additional sight line up top, making it easier to view up steep hills, something we took issue with on previous models. The new design is also said to make getting in and out easier. Vehicle dimensions remain very similar with a 64” width and 90.5” wheelbase. Overall length is 1.1” longer at 123.9”. Larger tires, plus all of the other updates, have added up to a small 11-pound increase in wet weight to 1523 pounds. Vehicle dimensions remain very similar with a 64” width and 90.5” wheelbase. Yamaha is really taking factory accessorizing to the next level, through your dealership or ShopYamaha.com. Yamaha is really taking factory accessorizing to the next level, through your dealership or ShopYamaha.com. 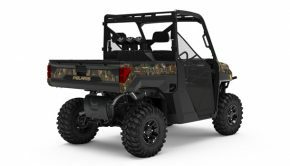 They have nearly everything you could want from basics like upgraded 4-point harnesses, more use specific 30” tire and wheel packages designed to work with the YXZ’s updated gearing, tire carriers, and added lighting. Electronics include audio systems and Yamaha’s recently introduced Adventure Pro, which is not only a fully functional GPS and Android tablet, it also offers vehicle integration including dashboard readings, vehicle warnings, temperature, and more. Windshields and cab enclosures add comfort for year-round use. 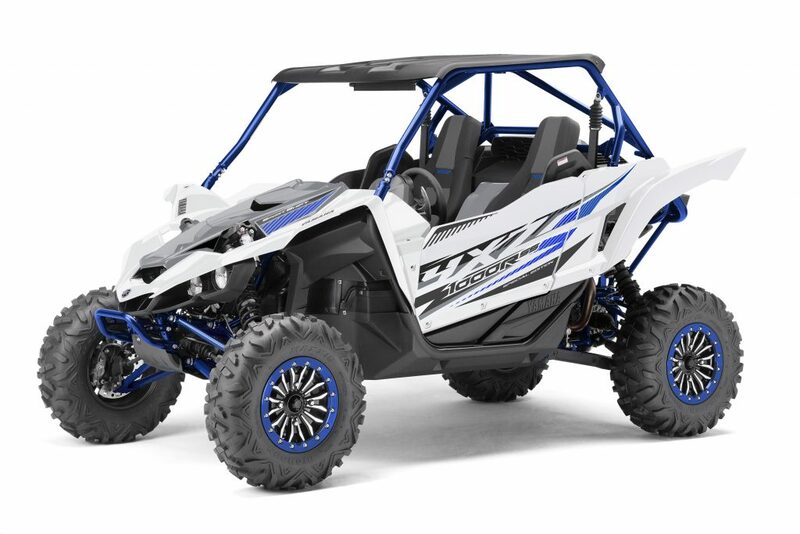 Yamaha even offers nearly all of the engine upgrades needed to turn the YXZ into a competitive closed course racer or hill shooter. GYTR parts on a naturally aspirated engine are designed to add up to 27% more horsepower. A GYTR turbo charger is claimed to add 60% horsepower with the stock exhaust and is 2016-2018 CARB Compliant. For those interested in even greater low-speed performance, especially with tires over 30”, Yamaha’s optional Torque Assist Gearing reduces 1st gear by 46.4% with a 23% reduction in 2nd through 5th. 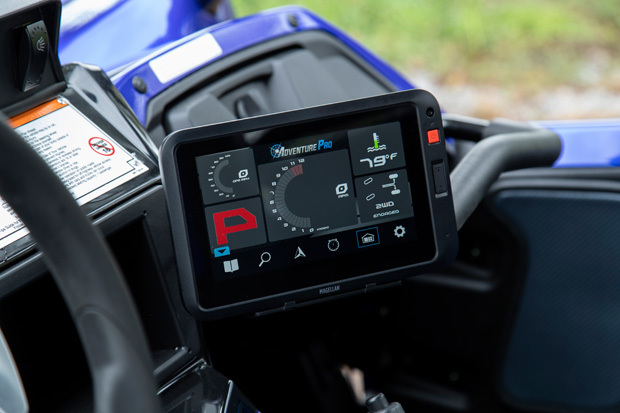 Yamaha’s recently introduced the Adventure Pro, which is not only a fully functional GPS and Android tablet, it also offers vehicle integration including dashboard readings, vehicle warnings, temperature, and more. 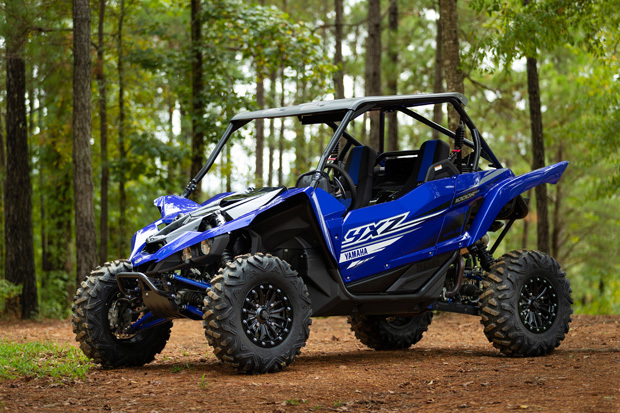 This is only a brief look at all Yamaha is offering for the machine, but of course, it’s the updated YXZ’s out of the box performance that matters most. 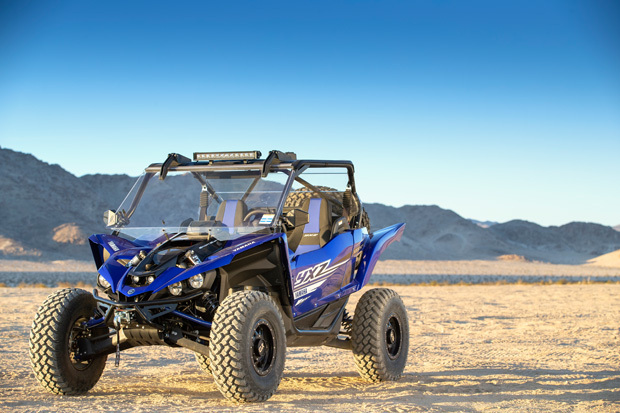 Stepping up to the 2019 YXZ1000R, the relocated radiator, revised front bodywork, and new cage lines give the YSZ a more racecar-inspired appearance. 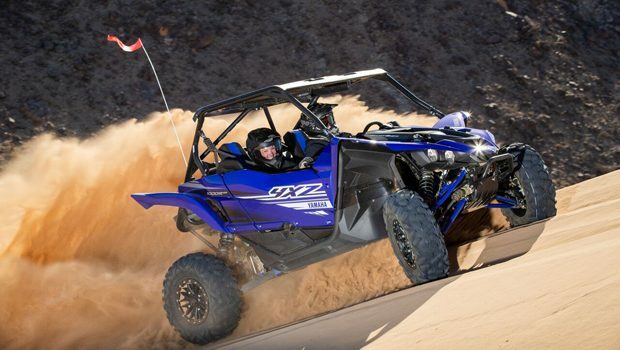 Ed Teixeira, owner of Teixeira Tech, test-drove the new YXZ for us. He has experience testing both stock and highly modified versions of the YXZ1000R SS, developing suspension components for 2017 GNCC champ and YXZ driver, Cody Miller. Ed is also a former Pro ATV desert racer; he knows something about going fast. Engage Launch Control, rev it up over 9 grand, release the paddles, and bury the gas pedal in the floor. The YXZ launches out of the hole more quickly than the 2018 thanks to its lower first gear. The 2019 also gets out of tight turns more quickly in first gear. In 2nd through 5th gears, acceleration seems virtually identical to last years with Yamaha seeming compensating perfectly for both the larger tires and their additional rotating mass. Whether you’re shifting up through the gears under power or rapidly downshifting scrubbing off speed, shifting is quicker and smoother in either direction. 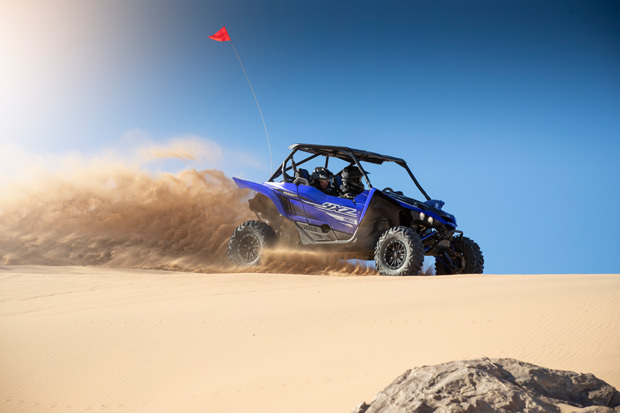 Power delivery is identical to previous years although the gear ratios and new Sport Shift settings make the YXZ’s engine far more effective for drivers of all skill levels at lower speeds. The engine is pretty docile in the first two-thirds of the RPM range. At low RPM’s, it never felt like a quitter, but now with a lower first gear, the engine can crawl along notably more slowly right off idle. 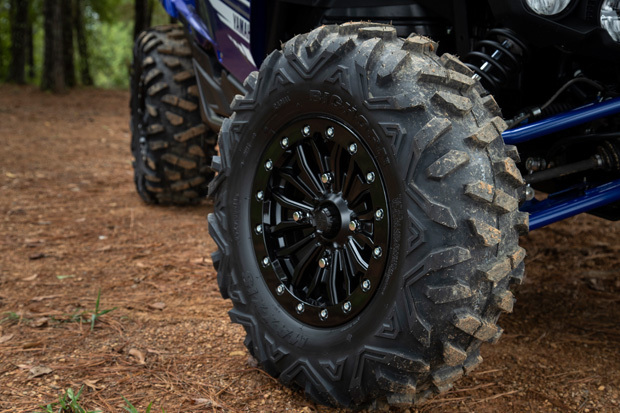 With every additional RPM pulling with greater authority, the taller tires can more easily roll over rocks, especially when the trail gets steep. With the engine’s increased leverage over the wheels, it’s far less dependent on the Sport Shift kicking in and slipping the clutch to maintain momentum under load at lower RPMs at slow speeds. Half clutching happens less often on the 2019 and when it does, the duration seems lessened and the process is notably smoother. Turning 29 or 30” tires, most typical trail drivers should be able to get along splendidly with the updated YXZ at low speeds. The distinct, yet manageable high-RPM hit, top-end focused power delivery, and manual shift transmission provide a thrilling and unique racecar-like experience that keeps the driver engaged. The engine’s manageable, mellow power keeps building throughout the midrange. Rumored to produce 112hp, the engine holds back most of its power early on, delivering the goods starting at around 7,000 RPMs ripping hard until redline at 10,500 RPMs. The distinct, yet manageable high-RPM hit, top-end focused power delivery, and manual shift transmission provide a thrilling and unique racecar-like experience that keeps the driver engaged. It’s a blast coming hot into corners, downshifting, and ripping out of corners while listening to screams of joy emitting from the engine, your passenger, and the voices in your head. With the revised gear ratios, there is, of course, a larger gap between 1st and 2nd gear, which can easily be bridged in most situations by revving it out a little farther in first. With the revised gear ratios, there is, of course, a larger gap between 1st and 2nd gear, which can easily be bridged in most situations by revving it out a little farther in first. 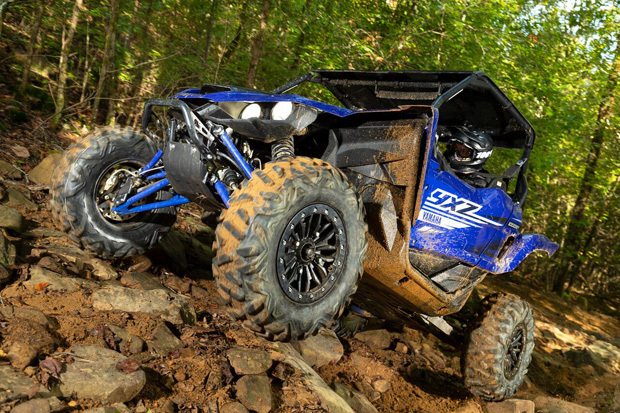 The YXZ remains anxious to be revved out and is happiest when doing it. We did notice the gap between first and second a bit more when upshifting to 2nd on the face of a very steep dune where we could simply rev it out for a few more feet until the dune tapered off, or we shifted up and growled up in second. The Sport Shift transmission will downshift at very low RPMs before it will let you stall the engine if you’re in a gear that’s simply too tall for your situation. 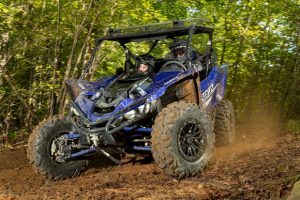 While we would still like a bit more power lower in the RPMs, the transmission mods have tuned the YXZ into a machine tight trail riders can really enjoy while enhancing its engine performance everywhere. Perhaps even more dramatic than the engine’s enhanced usability is the improvement in suspension performance. The dual rate spring-equipped Fox RC2 shocks come set up for a firm, yet forgiving, ride. For the smaller bumps that haven’t disappeared from the taller tires rolling over them, back off on the compression damping adjustments and the ride becomes instantly more compliant for long, casual drives. At mid to higher speeds, the shocks seemed pretty dialed right out of the box. Medium size bumps are taken in stride and big hits rarely find the limits of the suspension. Big hits feel less harsh and the car feels more composed on recovery. 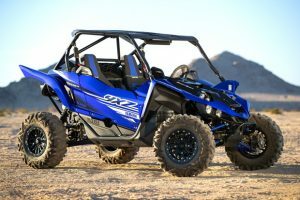 For 2019, the YXZ’s performance in high-speed whoops has been smoothed out quite a bit, thanks to its updated shocks and larger tires helping fill in the terrain. The front end remains brilliant and the back end now does a much better job at keeping up. The one glaring issue from years past was an unbalanced ride in high-speed, unevenly spaced whoops. The front end was brilliant, but the rear had a tendency to buck. With its higher spring rates, the shocks’ damping struggled to control shocks’ movement, especially rebounding from big hits. 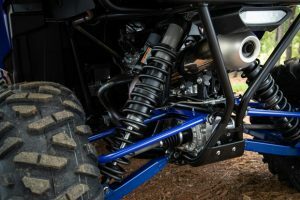 For 2019, the YXZ’s performance in high-speed whoops has been smoothed out quite a bit, thanks to its updated shocks and larger tires helping fill in the terrain. The front end remains brilliant and the back end now does a much better job at keeping up. 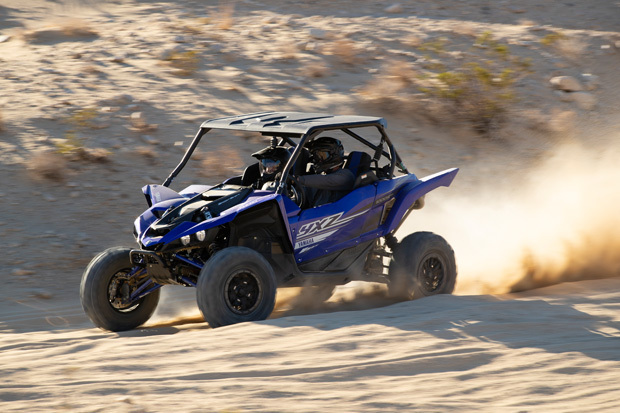 We used to let off the gas to settle the back of the YXZ; now, we find a dose of throttle to work well at calming the back end in all but the deepest of whoops. Under power, the rear shocks do a much better job at keeping the rear tires tracking with the terrain. In corners, the YXZ remains very stable and predictable. In corners, the YXZ remains very stable and predictable. Body roll is still well controlled, and Yamaha did a great job of keeping the machine’s center of gravity very similar to where it was in 2018 in spite of the taller tires. We felt the car steered at least as predictably as it did last year, if not better, thanks to the larger Bighorn tires’ increased contact patch. Power steering provides the right amount of assist at any speed while providing all of the damping we could ask for from impacts with trail junk. Recalibrated for the larger tires, power steering performance feels very similar to 2018. It provides the right amount of assist at any speed while providing all of the damping we could ask for from impacts with trail junk. We can’t find much fault with the new Bighorn tires. Their tread design is one of the very best on the market as a multi-purpose, multi-condition East Coast tire. They also perform decently in the drier conditions found out West. Their taller height helps smooth out the trail, and they allow the car to more easily crawl up and over obstacles. While the car’s maximum ground clearance was only raised .3”, the taller tires add a bit more ground clearance to the underside of the rear A-Arms, which are susceptible to dragging in deep ruts. We can’t find much fault with the new Bighorn tires. Their tread design is one of the very best on the market as a multi-purpose, multi-condition East Coast tire. They also perform decently in the drier conditions found out West. It says something for the tires that we never needed to engage front differential lock, but it’s definitely worth noting that Yamaha offers complete control over the drive system with selectable two-wheel-drive, four-wheel-drive, and four-wheel-drive with the front differential locked for maximum locked-in traction. Braking updates have resulted in more power and feel to match the machine’s greater speed capabilities. Braking updates have resulted in more power and feel to match the machine’s greater speed capabilities. For times when you’re crawling a hill at slow speed, the brakes are assisted by greater engine braking thanks to the reduction in first gear. Heat inside the cockpit seemed reduced as advertised. Quality and attention to detail are top notch from the full doors to all of the touch points inside the cabin. Yamaha has packed a lot more versatile performance into the 2019 YXZ1000R. We love that nearly every update to the car was focused on making it into even more of a no compromise, pure sport machine with improved durability. We were astonished that the abundance of improvements was somehow accompanied by an $800 reduction in the MSRP of the base model. We would have preferred a $500 drop in price and kept a roof as standard equipment, but for that much savings, we wouldn’t mind picking one up at the dealer. 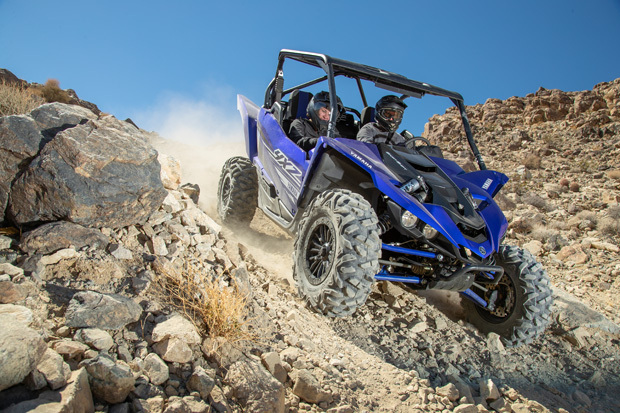 As we mentioned in the beginning, if you’re new to side-by-sides, the 2019 YXZ1000R is worth serious consideration. If you’ve been involved since the launch of the YXZ and weren’t sure if it was the right machine for you, we’d strongly suggest that you take a second look. 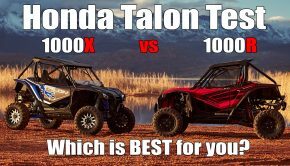 While we were fans before, the Yamaha YXZ1000R is our pick as the most improved sport side-by-side of 2019. 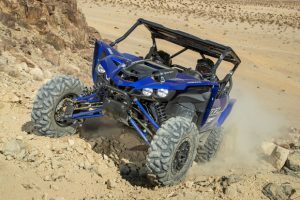 Summary: Yamaha has packed a lot more versatile performance into the 2019 YXZ1000R. We love that nearly every update to the car was focused on making it into even more of a no compromise, pure sport machine with improved durability. We were astonished that the abundance of improvements was somehow accompanied by an $800 reduction in the MSRP of the base model.